Breakfast smoothies can either set you off for a great day or make you crash at 10am. Especially if you’re buying commercial ones. And that’s a shame because breakfast smoothies are so easy to make. Plus, making them yourself is very cost-effective. That’s kind of a daunting list, right? Well, it doesn’t have to be: in this article, you’ll find a list of 21 different breakfast smoothies. I’ve already reviewed the ingredients and suggested modifications and ‘blood sugar control tips’ where necessary. Commonly asked questions about breakfast smoothies. 1. Can I drink breakfast smoothies every day? Yes, you can. Just like people can eat donuts every morning. But this doesn’t mean it’s a healthy thing to do. Why? Well, because your blender will be doing all the ‘chewing’ for you. In other words, since the initial step of digestion (chewing) is bypassed, smoothies can increase current digestive issues. Many people do lose weight when they consume green breakfast smoothies but that’s often because that smoothie is replacing some kind of processed food. 2. How often can I have breakfast smoothies? I usually advise my patients who just love breakfast smoothies to stick with 2 to 3 smoothies per week. And to have a few ounces of protein just before taking their smoothie. This way they get to chew a bit. For instance, they could have 1-2oz of liver sautéed in ghee, some stir-fried chicken, or leftover meat. 3. Are breakfast smoothies healthy? This depends on the ingredients you use. If the recipe calls for: syrup, low fat milks, artificial sweetener, ice-cream, artificial ingredients then it’s obviously not a good choice. Moreover, many recipes out there pack way too much fruit. Since the fruits are blended, the sugar in those fruits will be rapidly absorbed in your bloodstream. This can cause a hormonal mayhem and insulin resistance. 4. How can I ‘health-up’ my breakfast smoothies? • Stick with 1 to 1 ½ fruit per serving. • Add in some leafy greens. Don’t worry; this won’t be a “pinch your nose to scarf it down” experience. You won’t actually taste the greens. I’ve included a few examples in this article plus there’s also a ‘green smoothie’ section. • Avoid adding sweeteners if you’ll be adding fruits to your smoothie. And use unsweetened liquids (water, pure coconut water, coconut milk) instead of juices. • Add some form of healthy fat such as avocado (don’t use too much or you’ll end up with guacamole), coconut oil, coconut flakes, or nuts, seeds and their butters if you can tolerate them. • Have some protein with your smoothie – either add some collagen, gelatin, or accompany your smoothie with some lean meat or an egg. Now, let’s have a look at those breakfast smoothies! If you’re a huge fan of apples, then this recipe is right up your alley! To give this smoothie an authentic pie taste, I love pairing it with my home-made cinnamon graham crackers. Why bake my own crackers? Simple: most commercial crackers contain wheat plus loads of nasty chemical stuff. These crackers are super easy to make. Check out the recipe below to see how I bake mine. 1. In a medium bowl, whisk together the almond flour, baking soda, ground cinnamon, and sea salt. 2. Throw in the apple cider vinegar, egg, coconut oil, and honey. Stir until everything is well combined. 3. Cover your bowl and refrigerate your dough for about 30 minutes. 4. Preheat your oven to 325F and line a cookie sheet with parchment paper. 5. Transfer your dough to the parchment paper and top it with another parchment paper. 6. Use a rolling pin to roll your chilled dough to about ⅛ and ¼ inch. 7. Use a knife to cut your dough into 2.5-inch squares and transfer them to a prepared sheet. 8. Bake for about 12-15 minutes until you obtain golden brown crackers. 9. Let the crackers cool on the pan for about 5 minutes before transferring them to a wire rack to cool completely. • Add a handful of leafy greens to your blender – baby spinach tastes great in this smoothie. • A spoonful of peanut butter or almond butter is a great add-on in this smoothie. 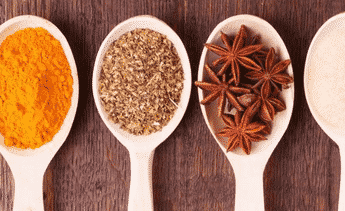 • Ran out of allspice? No worries. Sub it with some pumpkin pie spice. • If your apple is small, use 2 to get the right consistency. • ‘Pink Lady’ apples work best in this recipe. • Don’t like cooking things in the microwave? Just cook your smoothie in a pan. Looking for breakfast smoothies that are loaded with antioxidants? Then, this blueberry smoothie is exactly what you need! Fresh lemon zest, coconut milk, and cinnamon give it such a satisfying flavor that you’ll come for more. • Add a handful of leafy greens to your blender – baby bok choy gives a nice kick to this morning drink. Or you can stick with spinach. Is key lime one of your all-time favorites? Then, you’ll definitely want to add this recipe your list of breakfast smoothies. There’s such a great combo of flavors in this pie smoothie! Coconut cream, avocado, and banana fuse together to give you an extra creamy smoothie. And cinnamon, vanilla extract, ginger root, and steamed greens join the party, leaving you completely blown away. Great to know: In this recipe, the bananas make the smoothie creamy, and add a little sweetness to it. Want to omit them without altering the taste of your beverage? Just sub them with some vanilla yogurt. Word of advice: This recipe lists ‘greens’ as optional. But, if possible, do add them to this smoothie for reasons explained above. Nothing beats this creamy avocado and pureed pumpkin smoothie. Of all the many breakfast smoothies out there, this smoothie is special. Why? Well, because along with coconut oil, full-fat coconut milk, and essential oil, it also contains grass-fed gelatin and collagen. To learn more about collagen and gelatin, check out this evidence-based article. • Get your doctor’s approval first. • You want to use high quality lemon essential oil. • Mix the essential oil in a liquid first – this will ensure that the oil (and flavor!) get evenly distributed in whatever you’re cooking. A word of advice: If you’re lucky enough to get fresh pumpkins, use them to prep your puree. Canned ones are not as sweet and can make your smoothie taste awful. Plus they often come in cans that are lined with BPA. • Instead of canned coconut milk, make a big batch homemade coconut milk. Keep it in the freezer for when you’ll need it. • You guessed it: add some greens! Any mild tasting green leafy veggie will do. Don’t worry! This isn’t one of those green-looking smoothies that should be gulped down in one go to avoid getting its taste. Breakfast smoothies couldn’t get any easier thanks to this pretty beverage. • Add some chopped beetroot when blending your ingredients for an even tastier smoothie. Great to know: Wondering why your smoothie wasn’t as green as in the photos? This may be due to the difference in the ingredients that you used. Tip: If you don’t want to end up with a frothy smoothie, do not blend your ingredients for more than 20 seconds. Here’s an easy peasy smoothie recipe you’ll definitely want to add to your favorite breakfast smoothies. This minty smoothie calls for only eight ingredients and is ready in less than 5 minutes. Pretty cool, right? Throw together some chia seeds, baby spinach, almond milk, banana, and lemon juice. Et voilà! A sumptuous minty pineapple smoothie! Check the video below to learn an amazing way of prepping your own homemade almond milk. Have you been on a smoothie kick lately? Then, you need to include this cashew butter smoothie to your list of healthy breakfast smoothies! Check out the following recipe to see how I whip up my own cashew butter. 1. Throw all your cashews into your blender and give it a whiz. This should take up to 10 minutes. 2. Once you obtain a creamy mixture, use a spatula to scrape down the sides of your blender. 3. Add the salt to your mixture and blend for another 30 seconds. 4. Transfer to a mason jar or an airtight container, and keep refrigerated. Note: This cashew butter can be stored for up to 3 months if refrigerated. What better pair than cocoa powder and avocado for a huge burst of chocolate flavor? Five ingredients. 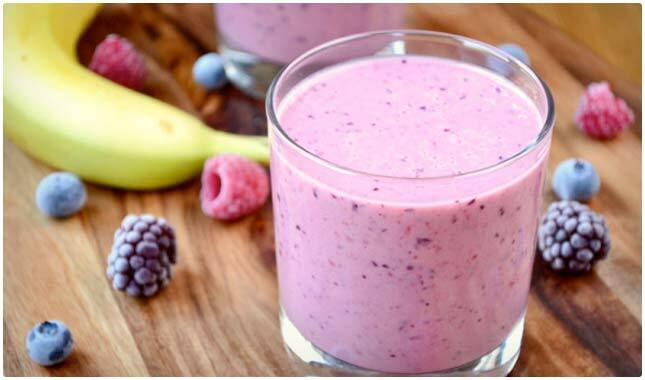 That’s all you need to whip up some of this mouth-watering smoothie. The unsweetened cocoa powder combines with the full-fat coconut milk, leaving this smoothie with an amazing creaminess. Chocolate lovers, you don’t want to miss that! • Two bananas and half a cup of raspberries? That may be too much if you have some form of insulin resistance (which is very, very common nowadays). Or if your blood sugar isn’t well balanced. I think this smoothie would be good enough with half a banana and the berries. • You could add a handful of mild tasting leafy greens in your blender – you’ll have the same great taste plus some extra antioxidants and potassium! • If you don’t have almond or coconut milk, feel free to use water. • Strawberries are a great substitute for raspberries. • Don’t like the overpowering taste of avocados? Just add some raw almond butter when blending your ingredients. • If you want your breakfast smoothie to have more of a mousse-like texture, use less milk. • After you’ve blended together all your ingredients, let your smoothie sit in the fridge for about 20 minutes. This will allow the avocado to blend with the rest of the ingredients. Time saver hack: Before freezing your bananas, peel and cut them in half. Place them side by side in a bag and in an upright position in the shelf of the freezer door. That way, once they’ve frozen, your bananas won’t stick together. Want to enjoy a thick milkshake without the guilt? Stop looking for healthy breakfast smoothies as this is exactly what you need. This velvety chocolate beverage is a classic smoothie consisting of almond milk, cocoa powder and some frozen raspberries. • 1 1/2 banana + 1 cup of raspberries = high probability of a sugar spike. So, use 1/2 a banana and 1/2 cup of raspberries. If that’s not sweet enough for you, you might want to work on your sweet tooth! • Add in those greens – they’re listed as optional in the recipe. On the hunt for an incredibly tasty and deliciously creamy coffee smoothie? Then, this almond milk, full-fat coconut milk, banana and almond butter smoothie may be just what you need. The banana adds a nice sweet touch to this smoothie, so, there’s really no need to add honey. • Throw in some Swiss Chard or watercress for a slightly peppery taste. Do you have PCOS? Or HPA-Axis dysfunction (a.k.a adrenal fatigue)? Then you might want to avoid coffee in the morning since caffeine can mess with your hormones. Flax milk. Banana. Hemp protein. Chia seeds. Cashew butter. Cinnamon. Cardamom. Ground ginger. Cloves. All these goodies in one single smoothie. Who’s in? • Add a handful of collard greens or dandelions greens for a healthier drink. Get ready to have your socks knocked off with this amazing smoothie shot! Prepped with juicy oranges, full-fat coconut milk, vanilla, honey, and ice cubes, this refreshing drink is simply perfect for breakfast! If you don’t do well with coconut (or if you just don’t have any on hand), you can replace the coconut milk with some almond milk. • This recipe calls for 3 to 4 oranges plus 2 tablespoons of honey. True, this drink does not contain as much sugar as commercial versions but it’s definitely not a ‘low-sugar’ recipe. So, you might want to use 1 orange, ¼ can of coconut milk, ½ cup of water, and ½ a teaspoon of honey. Or you could use the four oranges, 1 can of coconut milk, and two teaspoons of honey – this would yield four servings. • As mentioned earlier, instead of canned coconut milk, make a big batch homemade coconut milk. Keep it in the freezer for when you’ll need it. The beauty of this orange Creamsicle smoothie is that it is made with only a few simple ingredients yet tastes absolutely delish! Plus, it is so pretty to look at. Frozen banana, vanilla extract, orange juice, coconut milk, and vanilla protein powder. You can’t really go wrong with these ingredients now, can you? Note: Some brands of vanilla extract contain ethylene glycol which can be problematic for individuals with autoimmune diseases. Running short of healthy breakfast smoothies? How about giving this recipe a try? This delicious carrot cake smoothie features a great combo of ingredients. Full-fat coconut milk, carrot, and flax seeds provide a bright orange creaminess. Pitted medjool dates and a frozen banana add just the right touch of sweetness to this beautiful smoothie. And finally, vanilla powder is combined with cinnamon, nutmeg and a pinch of cloves for an irresistible flavor. One gulp of this pretty yellow smoothie will make you dream about tropical islands! Full-fat coconut milk is combined with pineapple, banana, and apple, giving it a super-rich and fruity flavor. Serving suggestion: Top your smoothie with some whipped coconut cream or toasted coconut flakes. • There’s way too much fruit in this smoothie – you can use ¼ pineapple, ½ banana, and ½ apple plus a handful or two of Romaine lettuce. • You can use coconut oil instead of MCT. This way you’ll also benefit from the antibacterial properties of lauric acid which is naturally present in coconut oil. Full-fat coconut milk married to cocoa powder. Such a perfect match! Why not make it one of your regular breakfast smoothies? Along with these two super star ingredients, crushed and lightly salted macadamia nuts, vanilla extract, ice cubes, and a dash of salt are blended together. Result? A creamy coconutty and chocolatey beverage with a delicious nutty taste. Yum! Sweetener tip: I always advise my patients to steer clear from artificial sweeteners and sugar alcohols. If you need to sweeten things up, add 1/4 of a mango or 1/2 a banana or a little bit of honey. This smoothie gets such a nice and sweet flavor from fresh or frozen watermelons seasoned with some mint leaves and lime juice. Serving suggestion: Love your smoothie to be super creamy? Add some fresh coconut cream or full-fat coconut milk when blending your ingredients. For an optional boost, you can choose to add collagen, MCT oil or hemp seeds. Bonus: Adding these extra ingredients will help keep your blood sugar levels more stable. Tip: If you’re lucky enough to find seeded watermelons, use both the fruit and its seeds when prepping your smoothie. The all-stars in this revitalizing smoothie recipe are coconut water, full-fat coconut milk, vanilla protein powder, banana, flax powder, chia seeds, blackberries, and blueberries. So, grab these ingredients, take your blender and let’s make this! • Omit the banana or use 1/2 a banana and 1/2 cup each of blackberries and blueberries. Want to munch into some yummy cookies for breakfast? What about drinking them instead? This Samoa cookie shake bursts with flavor thanks to full-fat coconut milk, almond milk, dairy-free protein powder, unsweetened coconut flakes, caramel sauce, toasted coconut flakes, and some chocolate chips. Who’s in? Want to know how I make a big batch of my own caramel sauce? Check out the following recipe. 1. In a large saucepan, bring your water and coconut sugar to a light boil. Stir the mixture continuously over medium heat. 2. Proceed by adding your coconut milk, vanilla extract, and salt. Let it cook over medium heat for 15 to 20 minutes. 3. Once your mixture starts to thicken and turns darker, your sauce is ready. 4. Set the sauce aside and let it cool. 5. Refrigerate in an airtight container. • If you’d love your shake to be richer and creamier, feel free to add more coconut milk or add some yogurt instead. • As mentioned in the recipe, you’ll want to avoid brands of coconut milk that come in cans lined with BPA, a chemical that messes with hormones. Make your own batch of homemade coconut milk and keep it in the freezer for when you’ll need it. Who said you can’t have brownies care for your health? Thanks to this original recipe, you can now enjoy a good chocolatey cake early morning, once in a while. Breakfast smoothies just got wayyyy better! This special batter is made with banana, avocado, collagen peptides, dark cocoa powder, full-fat coconut milk, water, and a pinch of unrefined sea salt. Pretty simple, right? • The banana sweetens this shake nicely – there’s no need for the maple syrup. • Don’t have coconut milk on hand? Sub it with some almond milk. • Not a huge fan of avocados? Don’t worry, you won’t taste it in this shake. Once you’ve had a chance to take one sip of this beverage, it’ll become your new go-to protein shake! Six ingredients are all you need to whip up this ultimate shake. And that’s if you count water as an ingredient of its own! • Feel free to sub your strawberries if you prefer blueberries. As mentioned in the recipe, raw egg yolks aren’t for everyone. Especially if you have an autoimmune disease. What’s your favorite smoothie recipe? Do you have any tips to share? We’d love to hear your thoughts in the comment section below or on our Facebook page. Great list of unique smoothies. I like the helpful tips under each recipes.